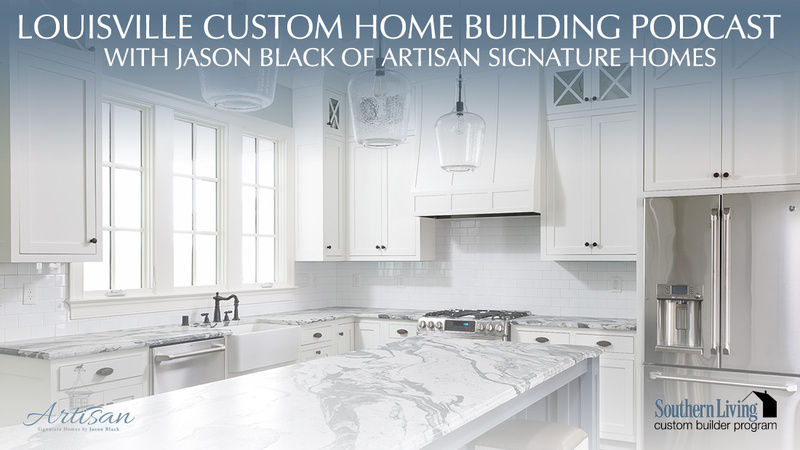 All right, this is Jason Black with Artisan Signature Homes taking over the mic from Greg today. He’s out dreaming up some new concoction in a kitchen somewhere, but I have another special guest with us today. I’m happy to introduce Jon Mand with Lenihan Sotheby’s International Realty. Jon: Thank you, Jason. I’m happy to be here. Jason: I’ve invited Jon to join us today. He specializes in the high-end custom real estate market here in Louisville, Kentucky and surrounding areas, and just want to get his take on the current market situation, where we are with high-end homes. Jon, give us a little history. How are sales this year for you guys? Jason: Just to refresh our listeners, when you describe high-end real estate what sector, what price point, are you referring to? Jon: We are really focusing at that $400,000 to $500,000 mark and above for the Louisville market. That’s about three times the median price point home sale in Louisville so that’s the metric that we use to judge the health of the high-end sector. Jason: Okay, fantastic. Are you guys selling some lots as well, or is that all just new homes? What makes your all’s business? Jon: We do a tremendous amount of lot sales for custom home build neighborhoods. We have eight different developments listed where we’re the exclusive broker for, and so for the last five years we’ve been the number one selling lot and land brokerage in the Louisville market. Jason: Does that mean you guys have a ton of agents out there? Jon: No. We have just a different model. They’re all full-time professional agents, so we have 21 licensed agents with the company and they’re all just very good at what they do. Jason: With 21 agents you guys have been the largest lot seller in … Wow. That’s pretty impressive. What are some of those neighborhoods you guys are in? Where are they at? Jon: We’ve got a lot of neighborhoods with Signature Green Properties is our largest development partner and relationship that we’re extremely proud of, but we’ve got neighborhoods from the estate settings of Harrods Glen, Glenview Park, Spring Farm Lake, all the way out to Goshen with Poplar Woods. We’ve even worked with some other developers on things as far out as River Glades or even off Lime Kiln at Glenview Springs. Jason: Okay, no, that’s good stuff. Now are these all old lots that you’re selling or any new developments coming on? What are you all seeing? Jon: These are a little bit of both. We have a lot of existing inventory that was developed during the boom years about 10 years ago and we’re still selling inventory out in those neighborhoods, very briskly at this point, to the point that we’ve had new sections opened in a number of neighborhoods just to keep up with demand. Spring Farm Lake was a brand-new development infill location between a couple other Signature Green Properties developments. That was brought online last year, I guess about 12 months ago, and we’ve since sold all but just a handful of lots in that neighborhood. Jason: Wow, congratulations. No, it’s good to see lots coming on. There for a while nobody was brave enough to bring new inventory in so that means for builders like me there’s a place to call home for another few years. Jon: That’s our biggest concern right now, is looking forward for the next several years. We’ve got some inventory, obviously, remaining that will take another 12-18 months, maybe 24 months to absorb but beyond that we’re getting concerned about the soon-to-be shortage of lots for custom home builders. For a developer to go buy some land today and put in a new neighborhood it’s a minimum of a three-year process, and that’s if they started today. To my knowledge, there’s no new developments of any scale sitting down at planning and zoning getting ready to go. I think we’re going to have a little bit of a gap to bridge there where inventory levels will get very tight for custom home lots. Jason: Okay, gosh, better be on the lookout here. Jon: Get them while you can. Jason: Talk to us a little bit about that high-end custom market. What are your buyers, when they come to you … Where do you get your buyers from? What are they looking for in a higher-end home these days? Jon: It depends, obviously, on the neighborhood and location, which development we’re talking about. We’ve got, obviously, just picturesque park-like settings out at Poplar Woods, in Goshen more pastoral kind of views and that sort of thing, all the way in to the estate lots in Harrods Glen. It really probably varies more on the lifestyle that the client is looking for. Do they want to be very close to the waters and expressway loop, in which case we’re over at Glenview Park with several different options there, price point, and lot acreage availability, or do they want to be out in Goshen with North Oldham County schools, or are they really just looking for a signature spot for a really prominent estate home, in which case we’d be looking in Glenview Park in the estate section there or over at Harrods Glen. It’s more driven by lifestyle and which neighborhood they gravitate towards. Jason: Okay. Once they find their neighborhood and they start either looking to build a custom home or even if you have somebody looking to purchase a home that’s already been built before, are there certain things that are a must-have that a client is requesting when they come to you? Jon: Yes, and it’s nothing surprising. I’m sure you’ve probably touched on a lot of these in previous episodes, but the openness of the floor plan. The hearth room is a big demand. Everybody wants that kitchen open to a nice family entertaining area there. Drop zones and mud rooms have grown considerably over the years. It seems that everybody wants that right off the garage, in between the garage and kitchen areas. The biggest thing that I think we’ve seen at the high-end segment, walkouts for a time were very desirable. We’ve seen a lot of people now gravitate towards … They still like the idea or concept of a walkout but side walkouts are really probably the most popular. People like having the outdoor entertaining space, a terrace on-grade, off the kitchen, hearth room, to be able to walk right out onto the ground there or onto the terrace and then have the pool on-grade, and then the side walkout gives you daylight windows at least. Jason: You get the best of both worlds. Jon: Yeah. Those have been the most desirable, so as soon as we roll out a new section in any of these neighborhoods it seems the side walkout lots get snapped up pretty quickly. Jason: Okay, good to know, good to know. I’m still trying to wrap my brain around the fact that you told me you guys are selling the most lots in Louisville and you guys are the leading high-end real estate brokerage firm. I guess, how do you do that? What makes you guys so special? How are you different than your competition? Jon: It’s a different model from top to bottom. In a nutshell, it’s just quality sells. That’s what we’ve been able to deliver. There’s no other brokerage in town that has the quality control or the execution capabilities that we have to do what every agent knows they should do, or even that they probably want to do, it’s just difficult to do all the time, every time. We’ve set up a system that’s very effective at delivering that. In our segment of the market, again, it’s what our clients expect. They’re all busy professionals. They’re business owners, executives, and they want somebody to come in and take care of this for them. They don’t want to have to worry about it. At the point they’ve made a decision to buy a house or sell a house they want a partner and their financial advisor for the real estate or sale that can come in and deliver the entire package. That’s something that we’ve just been able to perform with. Jason: Now, I’ve heard you guys … I don’t know if this is true or could possibly be true, but you actually go to every listing. Whether you’re listing the house or not, you’re with your client all the time through the whole process. Is that true? Jon: That is absolutely true and it’s a sad testament to the real estate industry that just showing up is a competitive advantage of ours. Yes, we only hire full-time professional agents. They’re all the best in the business. We require them to show up at every showing of the listing, so we don’t use the electronic key boxes on our properties. We want our agents there actually selling the property at the point a buyer or a buyer’s agent comes to take a look at it. From a marketing perspective we spend a tremendous amount of money and then also human capital on the marketing side of things. We do professional photography on staff. We have a full-time staff photographer, a videographer, a marketing director, and a marketing associate that handle full HDR photos, HD video for all of our properties with drones and aerial photography, and then we do a tremendous amount of online and print advertising to really generate the exposure that’s necessary to get these things sold. Jason: Is there a certain media that is driving your all’s business or do you have to use all the print, the social? What works for you guys? Jon: We use it all. We use it all and it’s probably the old adage that half of our marketing budget is probably wasted, but we don’t know which half so we just keep spending it all. It’s a combination of it. The print advertising we find to be phenomenally effective. Online, obviously, generating the content, the videos, the photos, those things, we drive a tremendous amount of traffic. Jason: I think that’s a good idea. I’ve seen countless MLS photos and advertisements from other firms that just aren’t the quality that, if you’re selling a million-dollar house, you want it to look like a million-dollar house. From what I’ve seen you guys are doing a great job with that. Jon: Thank you. Thank you. We work very hard at it every day, believe me. Jason: Good. Jon, I appreciate you joining us today. I think it’s been very informative for the listeners. Maybe we can have you back in the near future. Jon: Sounds great. I’d love it.